The new study area for Phi was all ready to go for Week 8 work. It is nice to have a place where she can work and we can keep her things organized. And I am so in love with the wall color. 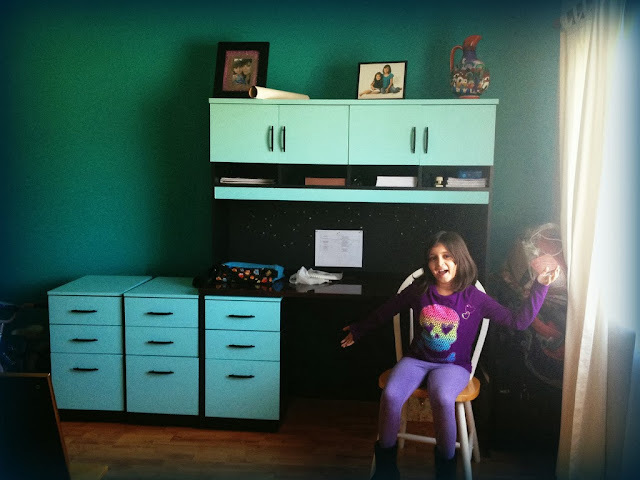 Big shout-out to Uncle Steve who painted the wall and desk so his niece would have a place to learn! 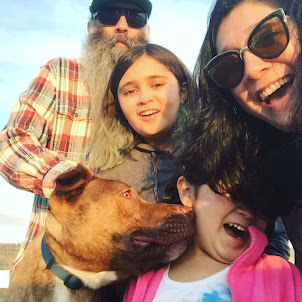 I may jinx it by saying this, but I think we have got this homeschooling stuff down. When the new weeks assignment list comes in I make up a schedule and we are off and running. 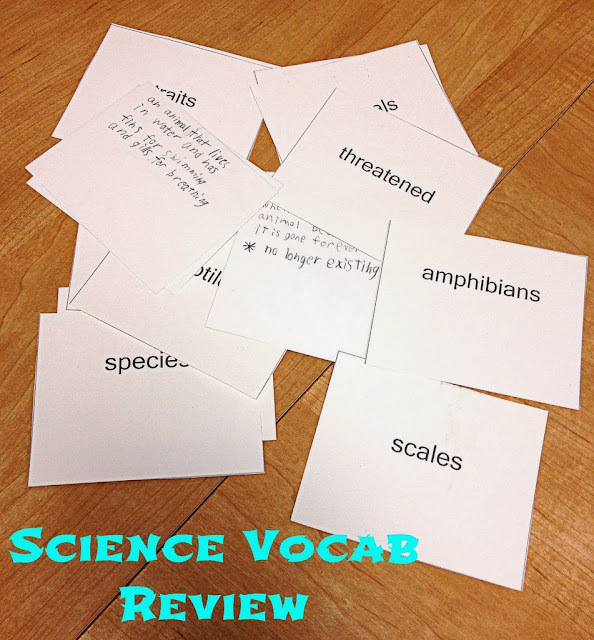 This week for science we had to review vocabulary words. I printed out the words on a heavy paper. I use a address label template on Word to make them. Super easy. I asked Phi's teacher to send me a copy of the glossary of the book she is testing with but she said she wanted the kids to look up the words themselves. Which of course is great until I realized that some of the words had multiple definitions. If I find that she is tested on different definitions than we had I may have to meet with the teacher. Then Phi went to the childrens dictionary on Wordsmyth.com and looked up and wrote down each definition. Throughout the week she reviewed them. Over the weekend I kept them in my purse and we played a game similar to Memory game to help review whenever we had some time. 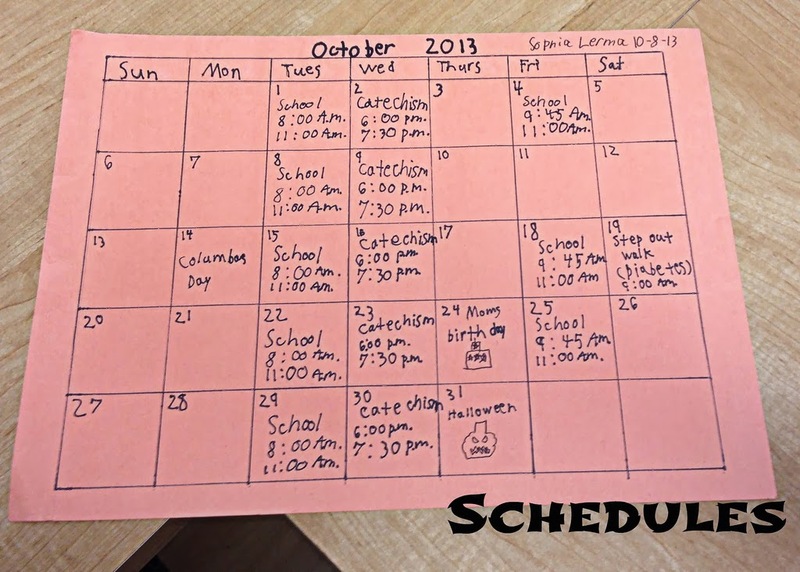 For math they had to make a calendar for October complete with 5 different scheduled activities. I loved that she had this assignment. I believe that organization is so important and learning how to keep track of your schedule is a must. Plus my birthday made it on the calendar and that is an important date to remember! 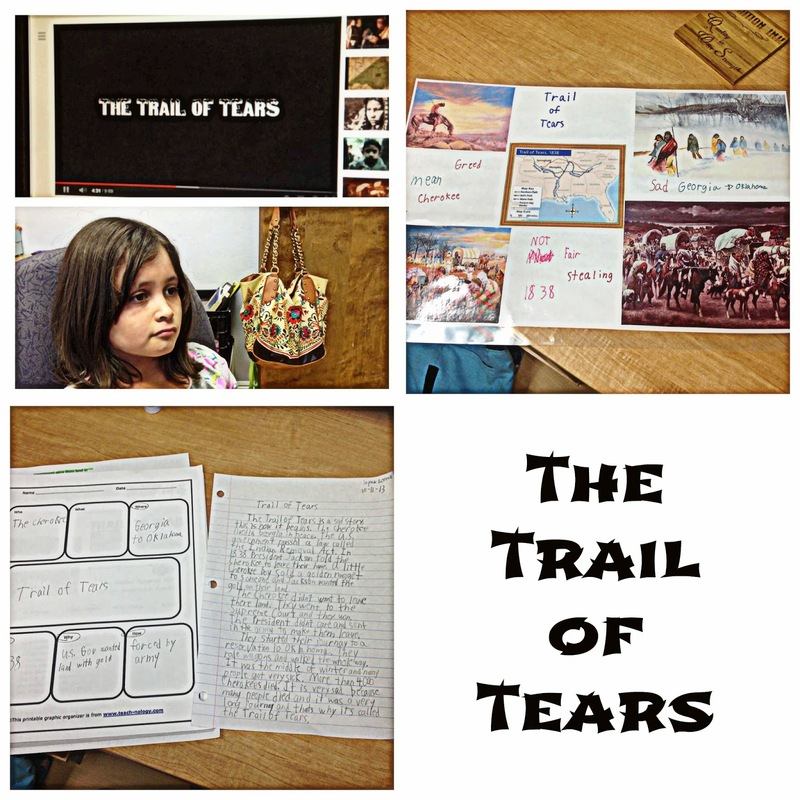 For history Phi had to research the Trail of Tears. I searched online and found a few handouts geared toward elementary kids on the event. I gave her a shorter one to read and she read and highlighted important facts. Then I read her a couple of the more intense handouts. I found a great short video on YouTube made by some junior high kids that we watched. The next day we got to work on the report. Her teacher wanted her to answer the usual 'Who, What, When, Where and How" so I found a simple worksheet with spaces to answers those questions. The story of the Trail of Tears really touched Phi. When it came time to write her paper she included so much detail that I am surprised she remembered. Before we were done we made sure that the 'who, what, when where and how" were addressed in her paper. We did a google search on the Trail of Tears and made a collage along with words that described the event. I have to admit I learned a lot during this assignment. The most fun project of the week was to write a spooky poem. Phi's teacher had gone over the different types of rhyming poems. Like AA, BB, or AB AB. Phi told me what she wanted her poem to be about a boy meeting a ghost in a haunted house. 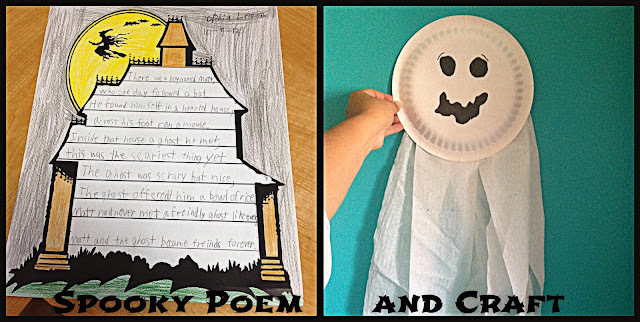 To make the poem a little more fun I searched for a haunted house writing paper online. I made a few photo editing adjustments and added lines for her to write on. Then we wrote the poem. We had such a good time coming up with rhyming words. After her poem was done Phi asked to color it. Coming from my kid who hates to color, that was huge. She is so proud of her poem and can't wait to read it to her class. who one day followed a bat. across his foot ran a mouse. this was the scariest things yet. the ghost offered him a bowl of rice. Matt had never met a friendly ghost, like ever. Matt and the ghost became friend forever. For the craft I did a quick pinterest search for a ghost craft and found this simple and fun one. A paper plate, some construction paper and some toilet paper. To fill in time during the week we did practice math worksheets on calendars and time and spelling worksheets. So week 8 is done and we are looking forward to week 9. Phi is going to start reading Charlotte's Web, which of course in not available on Kindle (ugh) so we had to borrow from the library, but I think she will enjoy the story. Way to Go Team Lerma!